and the division of the tongues in the upper chamber"
found in a codex in the British Museum. When a victorious king returns to his city, he bestows gifts and presents on all his soldiers. Our king, Who has won victory over the world, said: "I have overcome the world" (Jn. 16:33). When our King, Who had never parted from His Father, came back to Him victorious and ascended into Heaven, He swiftly sent great gifts to His servants. David bears witness to this, saying: ".....He hath ascended on high, He hath led captivity captive, and hath given gifts unto men" (Ps. 67:18, in the Syriac). What is this captivity? Our freedom which had been pledged to the will of Satan. But our Redeemer put him in bonds, threw him down and hurled him into a fiery furnace. And He gave power unto His servants, saying: "Ye will tread on serpents and scorpions and over all the power of the enemy" (Lk 10:19). And when He had put Satan behind His back and stripped his power by stripping Himself of His Body, He rose as a King, having won a great victory. He ascended to Heaven, attended by the glorifications of angels. He came back and arrayed the apostles with weapons by the coming of the Spirit. He spoke to us and taught us of His kinship with the Father. The Holy Spirit came and made known to us the invisible equality of the Trinity. He said unto His disciples: 'They that believe in Me shall speak with new tongues" (Mk. 16:17). This was accomplished by the coming of the Spirit. When the disciples were gathered together in the upper chamber, as Scripture says, a voice was heard and a violent motion took place. Light filled the house where they were sitting. "And there appeared unto each one of them tongues of fire"
And there was a voice that was to awaken the drowsy spirit of the Jews and to make them gather together and to draw them towards this wondrous sight: tumult for those outside, and light for those inside; dread for those outside, and consolation for those inside. "And they began to speak with diverse tongues, as the Spirit gave them utterance" (Acts 2:4). O upper chamber, that became a kneading-trough where the dough was kneaded that leavened the whole earth! O upper chamber, that became the mother of all the churches! O wonderful bosom, that gave birth to temples for places of worship! O upper chamber, that has seen the miracle that occurred in the bush; when Moses saw it aflame without being consumed, amazement laid hold of him. Come and see how members of flesh are transformed amidst tongues of fire! O upper chamber, that has astounded Jerusalem on account of the prodigy, more than the furnace did the Babylonians! [Lacuna). The fire of the furnace consumed those outside and spared those within; the fire in the upper chamber gathered together those outside, so as to behold it, but it consoled those within. 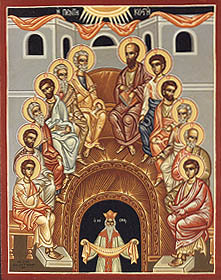 The fire in the furnace blazed around the bodies of the saints; this fire, however, burned in the apostles' hearts. O fire, whose coming was a voice, whose silence was light, whose activity was speech and whose truth was profession! Now the apostles were sitting on watch for the coming of the Spirit, like the soldiers of a King who wait for the moment when they can take up their weapons and go to battle. They were ready lamps awaiting the moment when they would be able to receive the flame of the Holy Spirit and enlighten the whole creation by their teaching. They were farmers who carry the seed in the folds of their garments and who await the moment when they will be ordered to sow. They were prosperous merchants who waited to start on their journey to distribute their goods over all the world. They were sailors whose ship is anchored in the harbour of the Son's commandment till a gentle breeze should blow for them. They were shepherds who had received a staff of the great Shepherd of the sheepfold, and who kept watch for the moment when the flocks would fall to their share. "Out of every nation under Heaven" (Acts 2:5), they were gathered together there by the Spirit's activity, and "every man heard them speak in his own language" (Acts 2:.6), and they said: are not all these which speak Galileans?" (Acts 2:7). "How is it, then, that they speak in our tongues?" But the Jews, who were always opposing the Holy Spirit, said: 'These men are full of new wine and drunken." Ye have told the truth, but not as ye yourselves suppose it! They have not drunk wine from the vine. A new beverage has flowed from Heaven for them. This is the Wine recently pressed on Golgotha. The apostles drank and they inebriated all creation with this drink. This is the Wine pressed by the crucifiers of Jesus and they did not taste it; it has been given to the faithful for remission of sins. This is the Wine, not from "a very fruitful hill" (Is. 5:1), that brought forth for the husbandmen "wild grapes" (v.2). For in these days new clouds rose up from Galilee, bearing plentiful blessings in order to pour them on the Vine ploughed by the Cross. Tell me, O Jew, are the apostles "full of wine and drunk?" Were the multitudes of the seventy elders, of which thou hast spoken (Num. 11:16-30), drunken with wine in the desert? Was the generation of the tower (Gen. 11:1-9), which received seventy tongues, drunk with wine? But when Noah, the just man, drank wine, his nakedness was uncovered (Gen. 9:20-27). The priests in the tabernacle, who drank wine, forgot what was proper, and they were devoured by the fire in the presence of the Lord (Lev. 10; 1-5, 8-11). Thou seest that all times drunkenness has been something shameful. How is it then that it has been beneficial to the apostles, so that after drinking they spoke in diverse tongues? But what am I to say to the mindless Jew? "If they have called the master of the house Beelzebub" (Mat. 10:25), how much more shall they call them of his household drunkards! "They have eyes but shall not see" (Ps. 134:16). "In the last days, I will pour out my spirit upon all flesh: and they shall prophesy" (Acts 2:7; cf. Joel 2:28). "Enter thou into the joy of thy Lord" (Mat. 25:21).